Zenique Hotels is Rupesh Patel’s vision. He has used his skill set to shape a hospitality company that is innovative, cutting edge, and unique. Aside from owning and operating over 10 hotels in the Bay Area, the company has developed five properties from ground breaking to operational status to building up revenues – which Patel was instrumental in developing – each has had its own flavor and style. Patel built his solid foundation at San Diego State University (SDSU), where he earned a Bachelors of Science degree in Public Administration and City Planning. At SDSU, Patel learned at an early point in his career the inter-workings of how fundamental developments occurred to ensure a successful and prosperous future with his family’s company. Nonetheless, Patel did not learn everything about the Hospitality Industry on his own. He was mentored by his father, Raman Patel, who is a successful and well known hotel entrepreneur in the Bay Area. Raman’s 35 years in the industry – owning and operating nearly a dozen hotels – makes for an expert professor and mentor who has laid the vital groundwork in Patel’s life to ensure what is certain to be a very successful career for him in the Hospitality Industry. 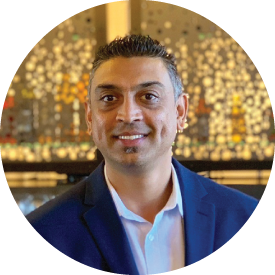 Since joining Zenique Hotels, Rupesh Patel has operated five different hotels in the Greater Bay Area of well known brands such as Hilton, InterContinental Hotels Group, Wyndham Worldwide, and La Quinta. In his current capacity as President and Chief Operating Officer of the Company, he has been trusted to oversee the operations, sales, and revenue management. He has successfully implemented several Property Improvement Plans (P.I.P.) by having methodical budgets – limiting expenses while creating unique designs and features. His resources in procurement have helped him build relationships with vendors whom have extended great discounts for his loyalty to their services. His most impressive feature may be one which he has conquered in 2013 for his work at La Quinta Inn & Suites San Jose Airport. Patel structured the acquisition, planned and implemented a multi-million renovation, and completely re-positioned the property in the market, doubling the revenue in just 2 years. Additionally, this property moved from #43 of 73 to #1 of 73 on TripAdvisor and was awarded Best Renovation of 2013 by La Quinta Inns & Suites. Throughout Patel’s career, he has racked up an impressive collection of accolades in a short period time. He has been praised for his focus and determination in providing consumers with the best possible customer service. His properties have received many awards – from the likes of world renowned franchises like InterContinental Hotels Group, Wyndham Worldwide, and Hilton- for the properties continued excellence in customer service and quality. Individually, he has been named ‘Merchandising Hero’ by VFM Leonardo for his strategies in online marketing, descriptive content, use of rich media, and social media. He is one of the youngest executives to earn such an honor. All properties which Rupesh currently owns/operates have received high marks from popular trip planning site, Trip Advisor. Operating hotels is not Rupesh Patel’s only forte. He has also been instrumental in the development, sale, and acquisition of almost all of Zenique’s assets. His firm understanding of raw numbers has helped him analyze hotel data to find opportune markets to develop profitable hotels. His unique ability to develop creative proposals has helped Zenique Hotels immensely. The future looks bright for Rupesh Patel and Zenique Hotels. The unparalleled customer service, quality, and re-positioning of hotels coupled with the unique atmosphere each property presents has proven to be a successful combination. The dedication and determination Patel has shown paves way for a limitless potential and a prosperous future.